With the opening of the wonder Skypark at Marina Bay Sands, Singaporeans who are thinking of jumping onto MRT tracks to quit this world, can now find a new and more exciting way to end their miserable lives on this tiny red dot on the map. 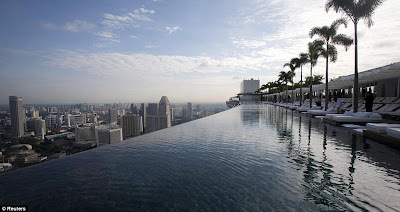 But before they take their final great leap, they must first go for a dip in the highest swimming pool on earth at 55-storey up, called the "Infinity Pool". They just need to take a short swim to the edge of the pool facing the downstream (see pictures), then roll-over or leap over the edge. If you fancy a dip in this pool, you'll need a head for heights - it's 55 storeys up. But swimming to the edge won't be quite as risky as it looks. While the water in the infinity pool seems to end in a sheer drop, it actually spills into a catchment area where it is pumped back into the main pool. At three times the length of an Olympic pool and 650ft up, it is the largest outdoor pool in the world at that height. It features in the impressive, boat-shaped 'SkyPark' perched atop the three towers that make up the world's most expensive hotel, the £4billion Marina Bay Sands development in Singapore. The hotel, which has 2,560 rooms costing from £350 a night, was officially opened yesterday with a concert by Diana Ross. The Emirates Palace Hotel in Abu Dhabi, estimated to have cost £2billion when it opened in 2004, was previously the world's most expensive hotel. 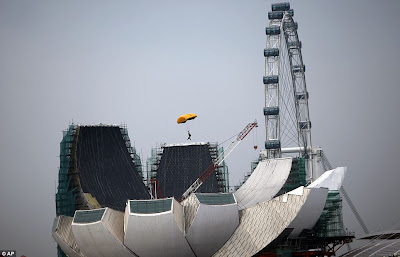 But with its indoor canal, opulent art, casino, outdoor plaza, convention centre, theatre, crystal pavilion and museum shaped like a lotus flower, the Marina Bay Sands has taken its crown. The infinity pool on the roof is in the 'SkyPark' which spans the three towers of the hotel. The platform itself is longer than the Eiffel tower laid down and is one of the largest of its kind in the world. Infinity pools give the effect that the water extends to the horizon. In reality, the water spills over the edge into a catchment below, and is then pumped back into the pool. The pools have two circulation systems. The first functions like that of a regular pool, filtering and heating the water in the main pool. The second filters the water in the catch basin and returns it to the upper pool. The Marina Sands resort was designed by architect Moshe Safdie who based it on a deck of cards. Inside shoppers can ride along an indoor canal in Sampan boats styled on traditional Chinese vessels from the 17th century. 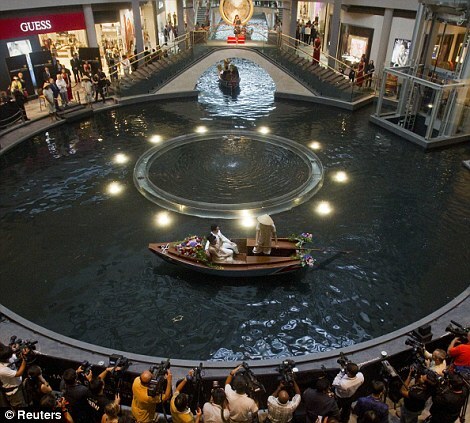 The owners have also commissioned five well-known artists to create works of art to 'integrate' with the buildings. Among these is a 40m-long Antony Gormley sculpture made from 16,100 steel rods. The whole thing weighs 14.8 tons and it took 60 people to assemble it in the hotel. Artist Chongbin Zheng created Rising Forest which is 83 three metre high pots with trees in them. The pots were so big the artist had to build a customised kiln the size of a small building to make them in. 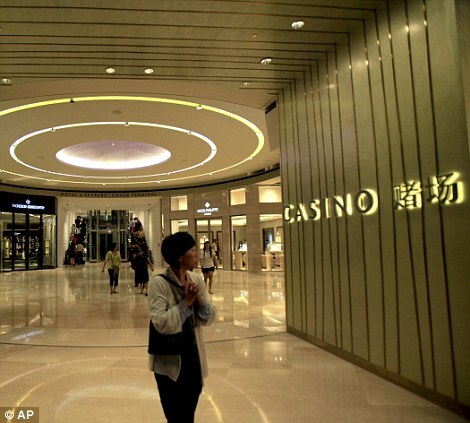 Last night, the world's most expensive hotel was given a launch party befitting it. Singing legend Diana Ross performed for 2,500 VIPs in the resort's Grand Ballroom and pop singer Kelly Rowland headlined an outdoor concert. The opening celebrations also featured a death-defying relay. Seven teams of three participants each scaled the three towers before sprinting across the 340-metre long Sands SkyPark, where the infinity pool is located, to the finish line. The resort will employ 10,000 people directly and generate up to £48m each year. Entrance to the casino alone is nearly £50 a day - but an average of 25,000 people have visited the casino daily since its initial phased opening two months ago. Thomas Arasi, president and chief executive officer of the resort, said he expects to attract an astonishing 70,000 visitors a day once it is fully open. It was due to open in 2009, but was delayed thanks to labour and material shortages, and funding problems due to the global financial crisis.